Good Morning! Happy Tuesday! I am so glad you're here and thank you so much for stopping by. The week is off to a fairly good start. The work day yesterday wasn't so bad, after a couple cups of coffee. This week's sketch is a fun one by Theresa. I love the simplicity of her sketch because it holds so much possibility as you will see with all the different designs from the team. I kept mine true to the sketch, clean and simple. 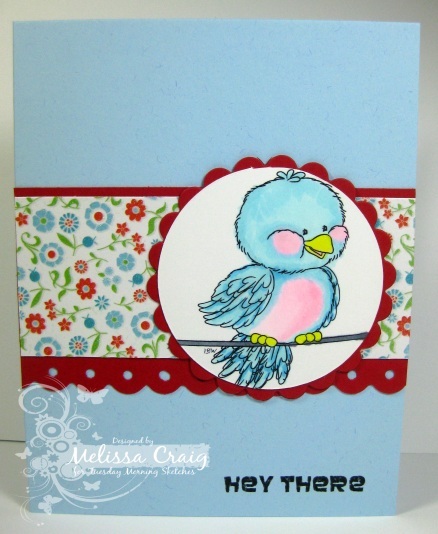 My card features the adorable signature bird image from our sweet sponsor, Laurie Wilson of Doodle Pantry. I love this color combo. You know who really ROCKS this color combo? My friend and DT member Jessica. Yep, she inspires me every time she creates a card with these colors. So, I guess we'll see you over at the TMS blog. Hello everyone! Happy Friday!! 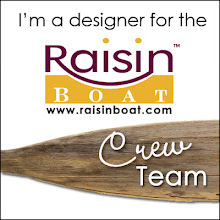 I am so excited that I have a guest spot on my friend Joni's challenge blog, Raise The Bar. Joni's challenge blog is all about pushing yourself to think outside the box. She never ceases to amaze me - she can look at something so obscure and come up with an amazing card design. Sounds pretty easy, right? It wasn't for me. I went so many avenues with everything ending up in the trash. I started with a trellis and flowers.... well that went into the trash. So I quit. I started cleaning my room and then it hit me. Why not use things that you just had to have, Melissa and then they sat in a box for safe keeping. Then I set off to find a great sketch and decided the best one was right at my fingertips - this week's sketch at Tuesday Morning Sketches. And look what I came up with. I bought these dies from a seller off the SCS BST forum. Had to have them, I had just gotten a Cuttlebug so I needed everything. I think I used the letters once. And very little stamping - really miniscule. This is a truly papercrafted card. Hi again! Thanks for coming back. I do so enjoy your visits. 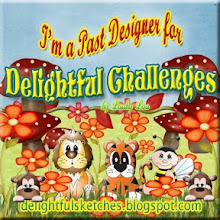 This week's challenge at Delightful Challenges is a fun one. Now, I've already shared my sentiments about Valentine's Day - not a huge fan. 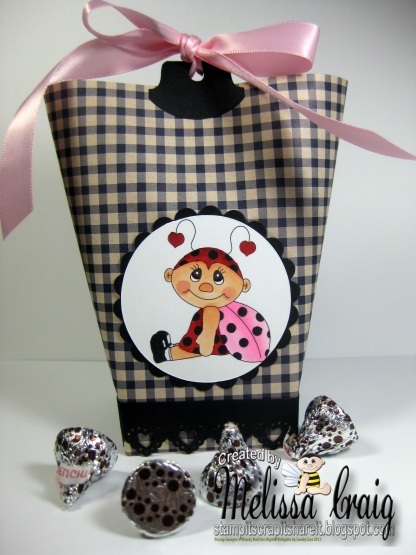 But I am a huge fan of fun paper, cute images and chocolate! I created this bag in a box by following a tutorial on SCS. This was fun, easy to do and pretty quick. You can make these for any occasion. In fact, I think I might make another one with a baby theme. There's a girl at work expecting, I think this would be adorable filled with binkies and travel sized baby powder and lotion. Good Morning! I hope you're doing well. I am sooo happy that Thursday is here. I have been really excited to share this card with you since Sunday. I love the colors and the Pretty Pattern for this week is great!! Isn't she just adorable?! I am really pleased with how this turned out. Now head on over to MTME Pretty Patterns to see some amazing designs by the team and since you're there, you might as well play along. Good Morning! I hope you all had a great weekend. It was good here, pretty much laid back. Yesterday evening was filled with football. My son is soooo excited that the Patriots won. I am, too, he was getting pretty grumpy there for a bit. And we have two new adorable sets releasing. I am featuring Lancelot. I love how my card turned out. Lancelot is such a super sweet bear and the papers I chose. Ack! I am sooo happy with my card even though I am not a fan of Valentine's Day. It used to be fun when my kids were little but not so much anymore. I did pull some inspiration from some other challenges, too. Now head on over to Paper Pretties to play along. Hello again. Please scroll down for the Delight Challenges post. But if you're here for the Pretty Pattern for this week - thank you for coming by. The Pretty Pattern is posted and we're having a great time with the MTME images. I am really loving the new warm hats set called Winter Knits. What a fun set. Now I admit, finding purple flocking in one of the drawers labeled "things that sparkle" is really what started this card. The great sketch by Tangii is awesome so it all worked together really well. Now, Tangii meant for this to be a long card, but I went with a standard size card. I love how the flocking added so much texture to this sweet beanie. So what are you waitin' for - go to the MTME blog to play along. Good Morning! It's time for a new Tuesday Morning Sketches challenge. This week we're sponsored by Cupcake Craftroom. Now I forgot an element on my card that's on the sketch and I didn't even realize it until I set the post up on the TMS blog. We'll just chalk it up to an "ooops." My card features sweet digi paper from Cupcake Craftroom that also came with a sentiment set. Good Morning! Quick post today - as most people we set these posts to auto-post as needed so I'm actually writing this late Sunday night. I had a super short weekend with working part of the day Sunday morning. So that severly cut into my normal Sunday schedule. I'm using an adorable new image called Slip n Slide. I love this image and it's sentiments! Fun right?!! They are having so much sliding around on the ice! I used a fun sketch from Sketches by Carly. I even found some silver paper in my stash. Wow! My card features Rockaround Sue. She's one of the nostalgic 1950's images released this week. I tried my hand at red hair. Not sure I like it but she does kind of remind me of a teenaged Pebbles Flintstone. 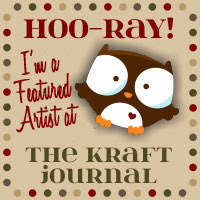 I used the sketch from Crafts4Eternity and I am also playing along with Digital Tuesday (punch it out). Thanks for stopping by, now head on over to play along with us. Good Morning! How's your week? Mine is going OK, its really busy at work which is mentally exhausting but we all get over it. We have a really sweet sketch to play with at My Time Made Easy Pretty Patterns. I am using the SWEET new releases, too. Have you seen them? If not, you simply must check them out. You can find them here. These new images worked so perfectly with the Nana's matstack that I have. You should join us - it'll be fun! Good Morning! It's Tuesday... the kids went back to school yesterday, Hollyanne is back at dance tonight, life returns back to normal. Yay! This week's challenge at Tuesday Morning Sketches has one of our favorite returning sponsors, Bugaboo, and it's the Judged Challenge. This week's sketch was created by Marie and it's fun and fabulous. As you know, with the Judged Challenge there is an added twist which will be to add a Vintage flair. 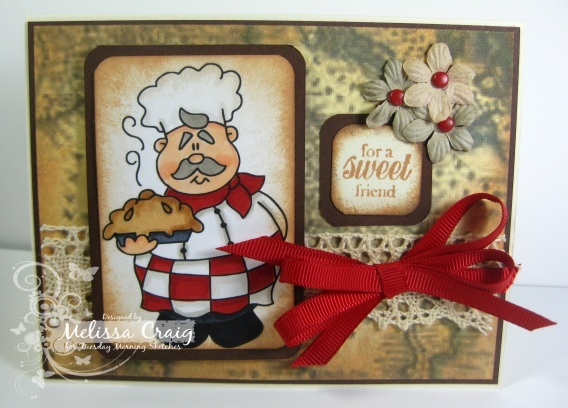 My card features Roly Poly Chef - Pie. When I colored this little guy, I figured he looked a lot like Chef Boyardee, so I gave him an Italian base. The background is a very pixelated old world map of Italy. Even though it wasn't a great picture, I thought it looked cool! I added some Desert Sand ink and Tea Dye distress ink and voila - I love this background. Now head on over to play along with us! Have a great week. 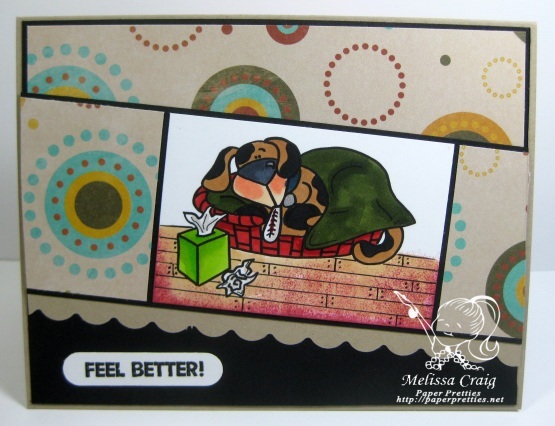 My card is featuring Sick Puppy. Don't you just wanna pick up this little guy and cuddle him til he feels better? I did use a great sketch from The Sweet Stop to create my card. I kept it pretty simple, as you all know, I feature cards every now and then that are single postage stamp cards. This is one of them. My colors mainly neutrals with black and kraft being the base. I also sponged the "floor" and then drew in the planks for a wood floor. Good Morning! It's a lovely Sunday morning. The sun is shining, I have a big mug of my favorite coffee and I am playing at my craft table - this is one of the ways I define bliss. I have a card to share with you that I made for 4 different challenges. I won a challenge over at All That Scraps, so of course, I have to play along with this challenge with my new stamps. So ATS' challenge is an Anything Goes challenge. I am also entering this card in the CMC Copic Challenge (Hot Pink, Black & White). And the iCopic Lover challenge is smooth and shiny hair. 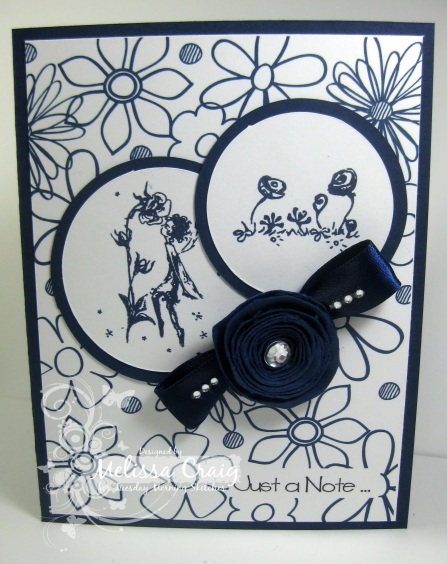 And finally, the card design is from this week's Just Us Girls sketch challenge. I usually don't combine more than 2 challenges, but this one worked so well. 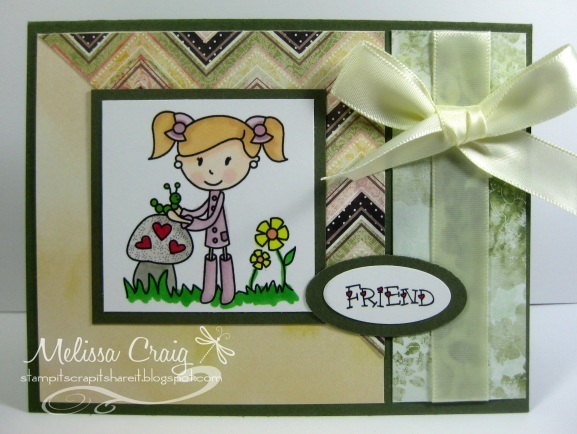 I have technique, sketch, color combo and the chance to play with new stamps from one of my favorite stamp companies. Another way to define bliss perhaps? I really don't like taking pictures during the day. If this makes any sense, my room has lots of sunshine but its so full of shadows, it's impossible get good pictures. This one I ended of having to take it with the card laying down on my bed and I shot above it. Crazy! Now you can see a bit of my cozy blanket (nope, the bed isn't made yet). And I'm still losing a little of the element in my card. Sorry. Good Morning! It's me again. Thanks for coming by my blog today. This week at My Time Made Easy Pretty Patterns challenge is a review. You choose your favorite sketch, please see the MTME blog for your choices. My card features the sweet images from My Little Friend. I pulled out some paper that I haven't used in a long time. This is Basic Grey Porcelain collection. Such pretty papers. Good Morning! We're back!! I am so happy that we're back from vacation for Digital Delights and we have a really easy and super fun challenge to start the New Year off with. 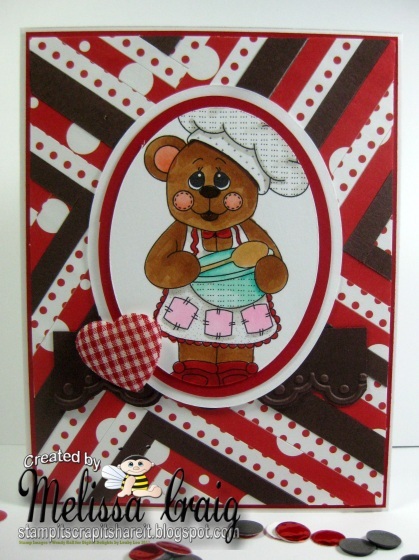 Here's my card - I am featuring one of the sweet images from the Baking Bears set. I created this card for my monthly card traders group, too. We had the herringbone technique this month - not my favorite but it turned out OK. 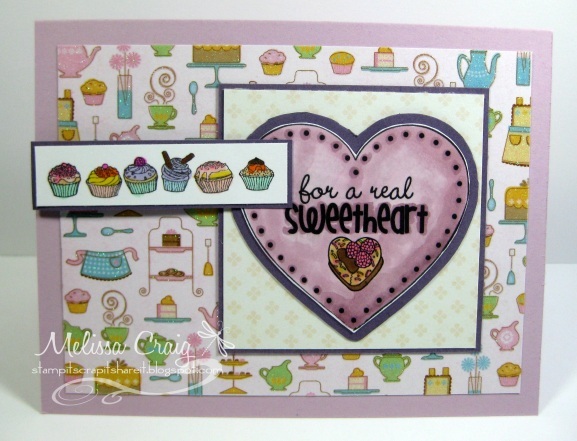 I also used the sketch from Sketch and Stash - my stash is the little heart embellishment. This was found in a box that belonged to my Grandma, there's no telling how long it's been in there. Good Morning! It's Tuesday and time for another great sketch at Tuesday Morning Sketches. This week's sketch was drawn by Kathy and it's great! 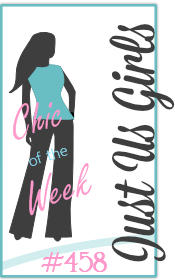 This week's challenge is sponsored by Sparkle Creations and she's offering a sweet prize. 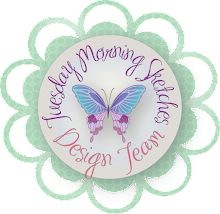 Be sure to check out all the details on the Tuesday Morning Sketches blog. 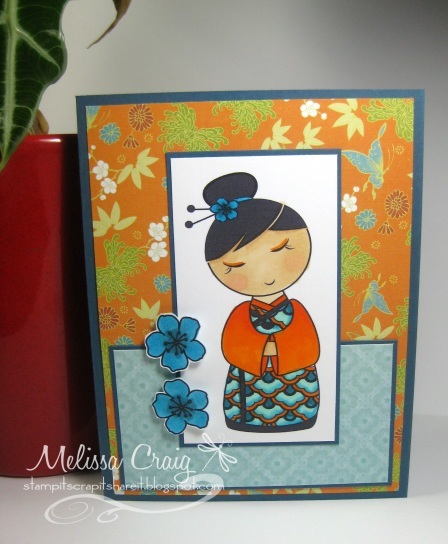 Here's my card featuring a sweet image from CC Designs. 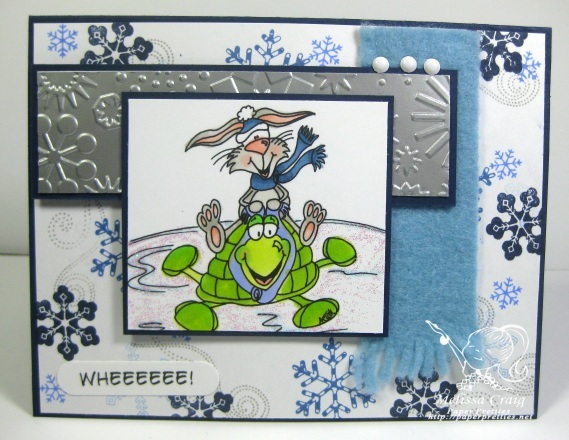 Be sure to check out the TMS blog to see the adorable creations that my team created using Sparkle's adorable stamps. I have had this image colored for a really long time and when I sat at my table this morning trying to decide on how I was going to create my card, I pulled this little cutie out of my stash and made my card. I think it came out pretty good. I also created this card with some chalenge inspiration from Really Reasonable Ribbon - Sparkle & Ribbon. My "sparkle" is all the bling I added and the "ribbon" is the gorgeous lace. Hi there! Happy Monday afternoon. This morning I was blurfing and having a really good time. I ran into a fun challenge over at Suzanne Dean's CMC Copic Challenge. I had an opportunity to meet her a couple of years ago, but unfortunately wasn't able to with the move to Florida. Sad for me but her forum is a lot of fun. I would love love love to take her Copic classes! Suzanne said it didn't have to be holiday themed, so I went with a Spring time feel. 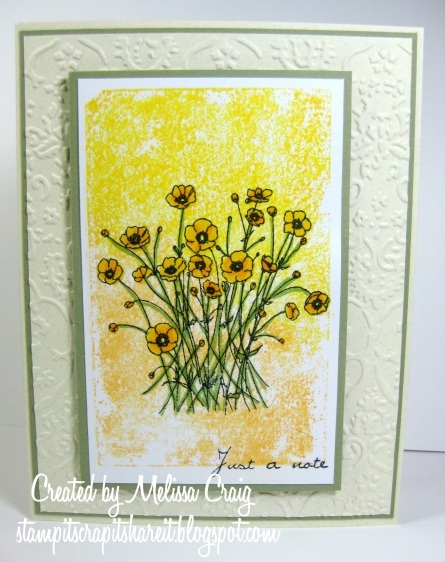 I brought out my Buttercups stamp set from TSG and had some fun. I did use a technique that I learned on my sister's blog to ink up an acrylic block to create a background. I did this using my Copics and spritzed with alcohol. Although it worked, it didn't achieve what I was wanting so I inked my block up with Memento inks to enhance what I did with Copics. This was a much nicer effect. Then I stamped the flowers on top of that and colored. And since it a New Year, it's time for those resolutions. What is the #1 resolution? Yep, to lose weight. So ARTish created a couple of new digi sets to encourage just that. 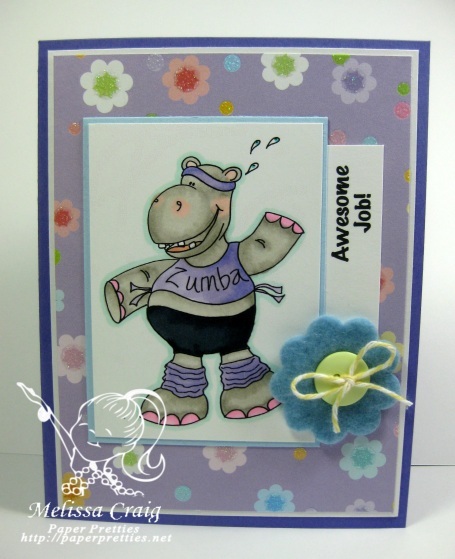 My card features ZaZa Zumba Hippo... she's so darn cute!!! I sometime have a hard time with clean and simple cards but I read a definition that CAS means little or no embellishments, straight clean lines. I think I fit that. But I did have to add a simple embellishment, a sweet little felt flower with button center and twine touch was just right. The challenge at JUGs this week is to put felt on your card. Now this is really simplifying their challenge so I might have to play again this week, but for this will do. Hi everyone! I am a bit late on my post today. It's been a busy weekend. But Happy New Year and welcome to the first post of the year on my blog. 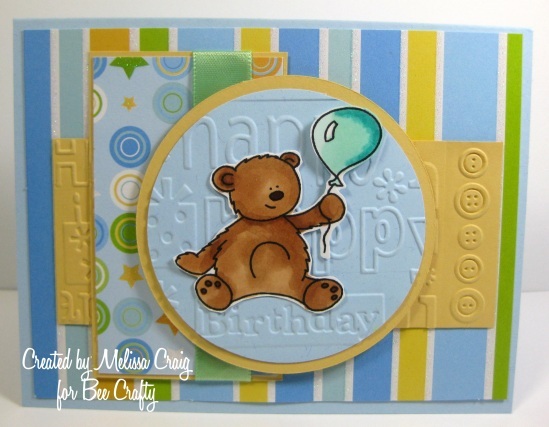 This card features a sweet little bear holding his balloon. I did create this card with a fabulous sketch from Sweet Sunday Sketch. I did a lot of embossing and then a lot of it got covered up. Not what I had in mind, but it's still cute.